Oh, good. You’re here. I thought maybe we had both forgotten where "here" was. I am glad we didn't. This summer was the best daylily summer ever – let’s just get that out of the way. I have posted at least 100 blogs in my mind as the adventures unfolded, but just never connected brain to keyboard. Almost 90 straight days of self-absorbed gardening, trying for the first time in years to spend more of summertime in my own garden than in others. I toyed with the chronology for my return to blogging, finally deciding to tell tales of what happened at the beginning of this growing season, working toward the end of summer as fall descends. Nights are already getting longer, and the sunsets fall more quickly these days. 70 long, sun kissed days ago, my official gardening season kicked off with the Oakland County Master Gardeners travelling by bus from Michigan to visit my Illinois garden. It was a weird happening, really, since my daylily-centric garden had ZERO daylilies blooming when they visited on June 5. But, the 60 of them thoroughly enjoyed the home cooked dinner and the informal lecture about daylilies. People oozed everywhere in the garden, peeking here, leering there – asking, commenting, touching, smelling, smiling and laughing. Here's what things looked like before the bus showed up at 5pm. When the people deboarded, I had iced cloths ready for them to use to "wipe off the ride." Since they had been on that bus all day, I thought it would be refreshing to clean their hands and face with a citrus-scented wet towel. See it there by the bus door above? This is what it looked like up close. This has been my favorite spot to star gaze this year. The lower patio is where the disco ball is, too, so you know there are always hi-jinks afoot in this area. Remember, these photos are from June 5...seems like forever ago. "I'm having such a great time. It's like visiting a favorite far-away cousin's house I don't get to visit often enough." I thought that was very sweet. It's how I felt, too. Anyhoo, the summer always ends where it starts. With anticipation, with plans, with intentions and hopefully with an iced wheelbarrow of beer - as seen above. 2014 was no different. I read somewhere that summer always folds in on itself; its end in its beginning. I am happy to be ready to enjoy the beginning again. 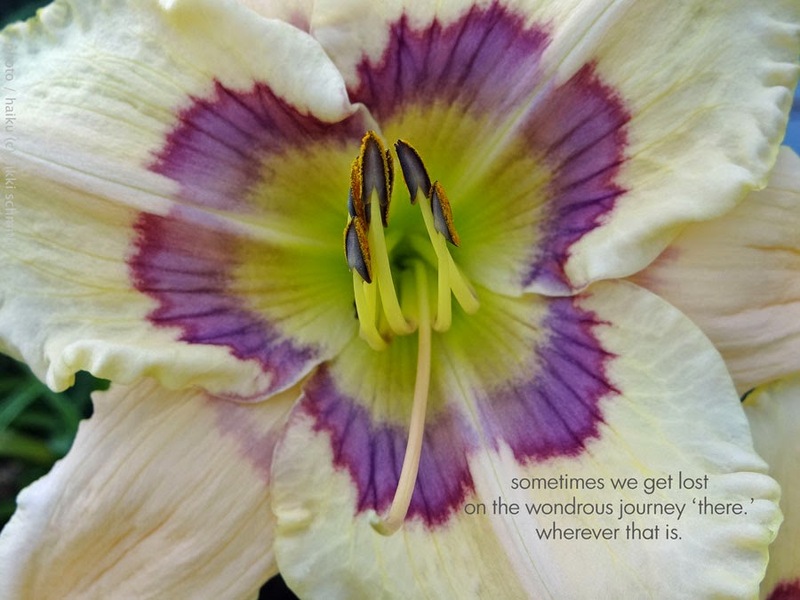 Til next time - here is Daylily Haiku Thursday a bit early this week. You can also connect with me on Facebook here for more frequent tales from the dirt. This would be a wondrous trip for any club to make. What Fun! You are the ultimate host. I enjoyed the visit if only through your words and photos. What a lovely way to start the summer. I loved hearing your story. It does take a lot of work, but it is so worth it to have so many people enjoy the Garden. What fun! Bill it is great to hear from you. I hope the greenhouse is kicking into high gear and that this bloom season was the best ever for you. I was dreaming about some of Diana's tomatoes the other evening... Please say hello to her and Sammy for me! Kathy- do come visit sometime! You can load up that car of SMDS members and c'mon down!! I know one gal by the name of Teresa that I'm sure would love to join me on a road trip. It's going on the to-do list. There are about 10 other good gardens to visit around me...c'mon on down next summer!